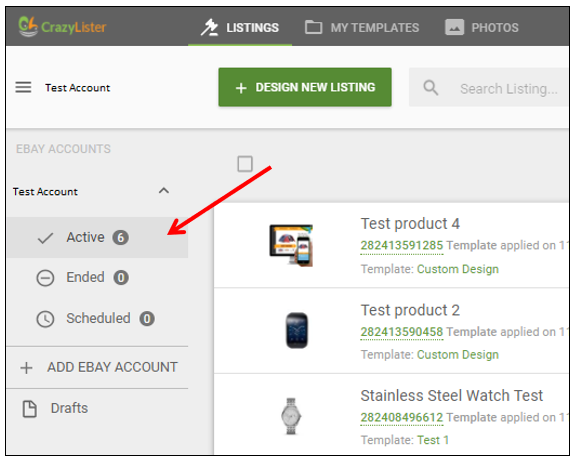 When you open the Listings page, under your eBay username you will see three categories, Active, Ended and Scheduled listings. Each section is in correspondence to the eBay listings you have on eBay, which means all of the Active (Live) listings you have on eBay will show up under the Active section, etc. Note: In case you have a live listing on eBay that isn't showing up under the Active section, please click on "Sync From Ebay" at the top right corner of the Listings page. The Find & Replace tool will only search within the category that you are in (Active & Scheduled). You will see the amount of listings you have within each category, Active/Ended/Scheduled (number beside the word Active). You can apply templates to your Active and the template will appear immediately, as usual. You cannot apply/remove templates in the Ended category. The Find & Replace tool is not functional in the Ended category. As time passes, ended listings will be collected. The Description Cleaner will not scan Ended listings. You can view and copy the text of the title & description from Ended listings and also Duplicate them to create a new listing. You can apply/remove templates from listings in the Scheduled category, but you will only see the listing with the template once it is Active. You can see the template if you open/revise the listing in eBay.